* 75 | Pre-views, level help, tips and videos for ALL Facebook King levels! You will have to carefully work your way through the lower section at level 75 (The light section in startegy picture 1). 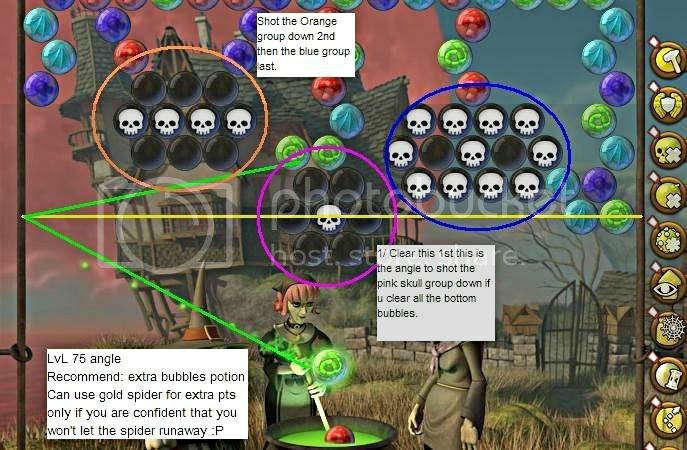 If you burst five clusters of Bubbles to get a green spider and after that drop even a small cluster of bubbles into the cauldrons, your are a good way to succeed with level 75! You should try to drop the black bubble section in the middle as soon as possible(Green line in strategy picture). Level 75 is the last level in Haunted Mansion. When you have completed level 75 you get rewarded with 500 in-game coins. You can also share these coins with your friends. You will need to get three friends to help you to unlock the next section of Bubble Witch Saga. Alternatively you can pay a small amount of FB-coins to unlock it instantly. Here I embed a video walk through brought to is by skillgaming (youtube).